K9 Cena's life ended on July 26 but his impact on Marine veteran Jeff DeYoung and the country is lasting. 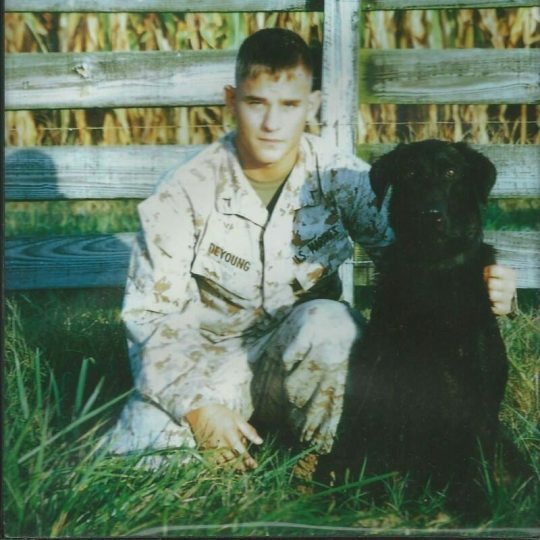 Cena, a black lab, and Lance Cpl. DeYoung served a successful tour in Afghanistan, fulfilling their mission to sniff out IEDs and bring the soldiers they served with back alive. Upon DeYoung's return the two were unceremoniously separated for years. Those turned out to be the darkest years of DeYoung's life, marred by alcoholism and suicidal thoughts. That is until, after a significant struggle on DeYoung's part to find Cena, the two were reunited and took on a new mission: changing the way the military handles military dogs once they're retired. Cena was diagnosed with aggressive bone cancer last month, which left him in severe pain and unable to walk. DeYoung decided the best thing was to end his suffering, as painful as it would be for the two to be separated again—this time for good. After DeYoung asked to borrow a Jeep Wrangler for a top-down final ride with Cena, people from all over his home state of Michigan responded and an event honoring Cena's service was organized by the Patriot Guard Riders and the U.S. Marine Corps League. In front of the hundreds of people who'd gathered to honor Cena, DeYoung carried him—just as he'd carried him across rivers while on patrol in Afghanistan—onto the retired Navy vessel USS LST 393 while a bugler played "Taps." A veterinarian then ended Cena's suffering. After the ceremony, DeYoung traveled to Alaska to be with his family and grieve. He took a week off from speaking to the media before sharing his story with the Washington Free Beacon. DeYoung and Cena's bond was formed on deployment, trying to find improvised explosive devices planted by Taliban fighters before they could kill American soldiers. Cena kept DeYoung warm on cold nights in the Afghan wilderness and DeYoung laid on top of Cena to protect him from enemy fire during gun fights. The danger and stress were immense but having Cena by his side helped DeYoung cope with what they were facing. "Everything seemed easier, because you didn't do it alone," DeYoung told the Free Beacon. "I mean, if you went out on patrol, he was there. You always knew whatever new area you went to, any scary situation, you had that security blanket of knowing he was there. It definitely made it easier for myself and a number of the guys I was working with. Because they started developing a relationship and trusting him and in return trusting myself and my buddy, Cena. I mean, we became family." The team never lost a soldier they were tasked with protecting. "Most people measure success in the amount of IEDs you find," DeYoung said. "But I measure success in the fact that every single one of my guys came back to safety that I took out on that tour. In that measure, I'd say I was very successful." Despite that, when DeYoung's tour of service was up, the two were separated without even a chance to say goodbye. "We came back to Cherry Point, N.C., and they were returned to their civilian handlers, the corporation that owned them and then retrained and retasked to go back out," DeYoung said. "It didn't really hit until three or so weeks until after my deployment. I mean the day that we separated, I was like, ‘Hey, what the hell, that's my dog.' I really wanted to get home, so it kinda gets put on the backburner." After Cena was redeployed to serve once again, DeYoung tried to figure out where his dog was, how he was doing, or if he was even alive. But nobody would answer his questions. "The civilian owner would not tell me if he was dead or alive, retasked or whatever," he said. "They wouldn't give me any sort of data. And I know they don't have to, but maybe as a moral courtesy to the guy who fought in war with the dog, that might be nice. Eventually, years down the road, I chalked it up to him being dead. I guess that was easier for my life." Without the steadying influence of Cena, DeYoung had difficulty coping with the losses he'd experienced while serving and the transition back to civilian life. "I battled a lot of things that veterans do—alcoholism, depression, suicide attempts," he said. "I pretty much alienated the ability to get close to anything, including my wife, because the closest thing I've ever known to myself left. You know it doesn't help a marriage when you're afraid to commit." Cena was retired in the fall of 2013 but instead of reuniting with DeYoung he sat in a kennel for 8 months and was nearly given to a civilian adopter—a problem many dog handlers have run into while trying to find their own dogs, some with even more tragic outcomes. DeYoung said the delay in reuniting with Cena also delayed his recovery. "I didn't adopt him until June ," he said. "All that time he was just in a kennel. Now, if I had got him back that August, I think the healing could have started eight months earlier." DeYoung credits Cena with saving his life—not just on the battlefield but back home. In the three years he was able to spend with Cena after adopting him, his life completely changed. "It was amazing," DeYoung said. "The four years without him, I was nobody and nothing. I did not want to socialize, I could not go out in public. Once I had Cena with me, I could do things like hang out at a brewery or go to a movie. People started approaching me and treating me more socially and initiate friendships. All because I had a topic to start talking about: my dog. I started actually having friends, something I've never had before. "He gave me my life back. I didn't know what I was missing until I had it." Still, it took time for Cena's renewed presence to really sink in, for it to feel like it was really happening. "Everyone thinks trauma hits right away. In certain cases, like a car accident or family death it does," he said. "But in others, it has to really infiltrate your life and then you notice it. Having him back the first few weeks, I used to run downstairs at two o'clock in the morning just to see that he was still there with my kids. He was laying on his bed. I would do that for two or three weeks, I didn't believe it was real. Once I accepted that he wasn't going anywhere and that this was for real, I started working on healing." 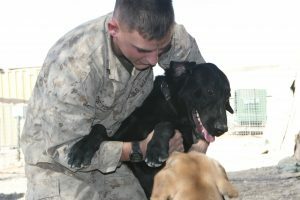 After the struggle DeYoung and Cena went through in their efforts to reunite, they decided the process for military dog handlers to adopt the dogs they served with needed to change. That's when they teamed up with the American Humane Association to lobby Congress. In December 2015, their efforts walking the halls of Congress and talking to lawmakers paid off, and they accomplished their mission. Thanks in large part to their efforts, President Obama signed the 2016 National Defense Authorization Act which guaranteed military dogs a ride home at the end of their service and their handlers the right to be the first in line to adopt them. "We spent every chance we had advocating for military dog rights and PTSD vets. Something as simple as a canine or a dog could be life changing and we need to be doing everything we can to get these dogs back," DeYoung said. "I did the math a little while ago—of the 13 Marines I deployed with who had dogs, I'm the only one to get mine back. That's about a 7 percent success rate. And that's not okay." Having Lance Cpl. 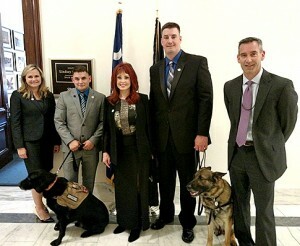 DeYoung, K9 Cena, and other military dog teams meeting with politicians, staff, and press on Capitol Hill brought a different dynamic to lobbying for an issue that faced little overt opposition but was in danger of being viewed as too small to drive actual legislation. Seeing the military dog teams in person, experiencing their bond, and seeing the impact the dogs had on the lives of those veterans was a game-changer for many. "Until you actually see something up close, whether it's two wingmen or a dog handler and his dog, until you see it up close, it's just going to be a foreign, cold subject," DeYoung said. "You're not going to understand it. Unless perhaps you've lived it yourself. 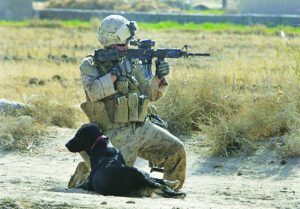 Of course, you understand dogs as a pet, but as a warrior, there's a bond you have to experience to understand." The American Humane Association, which DeYoung will continue working with as an advocate for military dog teams, said Cena won't be forgotten. "Military Working Dog Cena is a true American hero and an inspiring testament to the life-changing power of the human-animal bond," Dr. Robin Ganzert, the group's president, said. "He will be greatly missed by all those who knew and who owe their lives to him. His work and his example will live on in the memories of all who knew him and were touched by his story." Though Cena's memorial was greeted by most with respect, DeYoung said he's bothered by those who complained the event was too much for a dog. "Some people, and I've seen their comments, who have said, ‘Oh he's just a dog. Why would you do this for a dog?'" he said. "But there comes a time when once deployed these dogs become so much more. They become family, or a mascot, or a good luck charm. When you're overseas and your little piece of sanity is that dog, you'll do anything for it. This dog has done more for this country than half the people who live in it. And I think he deserves respect for that." Just as his reunion with Cena took time to really set in, DeYoung said he knows his loss of Cena—this time for good—hasn't really set in yet. "It's been a week since I had to say goodbye, but it hasn't really hit yet," he said as he talked to the Free Beacon during a layover on his flight back to Michigan from Alaska. "I just want to get home. Once I actually try to get back there and I have to rebuild my life and not just myself, I'm going to go through a lot of those things. But this time there's no hope of getting him back. Part of my time when we first separated was ‘I want my dog back. I need my dog back.' There was a chance the first time." Cena will be laid to rest at the War Dog Memorial in Lyons, Mich., on August 26. A fundraiser to build a statue in his honor has already surpassed its goal. "He was just a really great dog," DeYoung said. "It was his time, and he had nothing to prove to anyone." This entry was posted in Issues and tagged Feature, Military. Bookmark the permalink.